Denver Starfest 2019 is coming up this weekend, April 26-28. Guests of Honor include William Shatner and Nichelle Nichols of Star Trek fame, Ben Browder of Farscape and Stargate: SG-1 and many others. But best of all, I’ll be there, in Author Alley. (Okay, maybe I don’t quite compete with the likes of the above.) There’ll be lots of other things to see and do, too. The fellow, er, robot on the right there has attended many a Starfest. 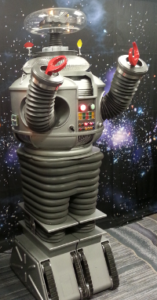 You may remember him from the original Lost In Space TV series. He (rather, a look-alike) also shows up in my upcoming The Centauri Surprise, for perfectly logical in-story reasons. I will have copies of my books for sale, maybe a few giveaways, and I don’t charge for autographs. See you there?